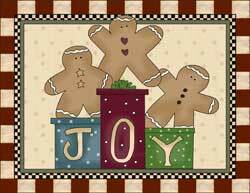 Print these Gingerbread Christmas cards on cardstock, fold in half and cut to size. 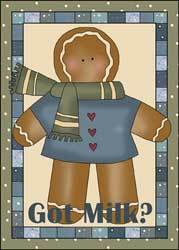 The card is on a 8 1/2" x 11" background so when the gingerbread card prints, it will have a full blank section for the back side of the card. These Christmas cards will fit in a 5x7-inch envelope, which can be found at craft stores and big box stores.The cards will print at 4 1/2-inches by 6 inches.. 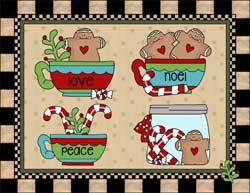 The graphic itself can just be cut out and used as a gingerbread Christmas postcard, still using the 5x7-inch envelope, signing on the back or front of the postcard. To print a greeting inside the card, click here for instructions. For a homemade touch, try embellishing the card with glitter, fabric, pom-poms, rhinestones, sequins, felt snowman hats, flannel winter scarves. Click to view embellished examples. 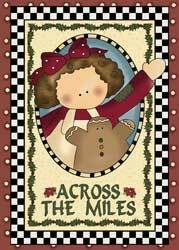 If you would rather purchase the finished cards, we have that option available. Available to purchase is one card, 10 cards or a 20-card pack.